For a lot of people, February 14 is a day to celebrate romantic love by raising the stock value of Hallmark Cards and paying inflated prices for dinner at a restaurant. And you might think Hawaii would be a great location for a romantic getaway, but Captain Cook would disagree. When Cook and crew arrived, they were the first Europeans seen by the Hawaiians. Their ships were impressive, and the Hawaiians were captivated by their wares. Look at this from the Hawaiian perspective. At that moment, the Hawaiians were celebrating a festival to their fertility god in the god’s sacred harbor: Kealakekua Bay. So here come these massive ships with large white sails right into this sacred harbor. The gods have arrived—and they’ve brought amazing things. One of the sailors died. Don’t you hate it when mortality gets in the way? This made the Hawaiians suspicious. Captain Cook returned. 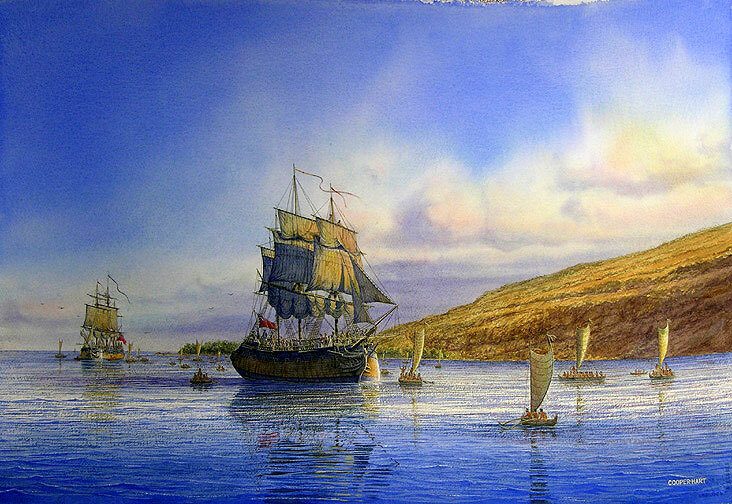 Cook and his ships left the harbor, but violent storms forced them back to Hawaii after a week at sea. The festival was over, so why are the gods returning? Wait a minute … THEY’RE NOT GODS AFTER ALL! That’s when it got nasty. The return of Captain Cook was met by rock throwing, then stealing, followed by a mob attack. On February 14, 1779, Captain Cook was stabbed in the back with a knife he had given earlier as a gift. Bummer. This wasn’t the first time people turned on their gods. On his first missionary journey, Paul healed a man in the name of Jesus. When the crowd saw what Paul had done, they shouted in the Lycaonian language, “The gods have come down to us in human form!” Barnabas they called Zeus, and Paul they called Hermes because he was the chief speaker. The priest of Zeus, whose temple was just outside the city, brought bulls and wreaths to the city gates because he and the crowd wanted to offer sacrifices to them (Acts 14:11-13). Unlike Captain Cook, Paul did not try to take advantage of the situation. But when the apostles Barnabas and Paul heard of this, they tore their clothes and rushed out into the crowd, shouting: “Friends, why are you doing this? We too are only human, like you. We are bringing you good news, telling you to turn from these worthless things to the living God (vv. 14-15). The crowd was determined to honor Paul and Barnabas as gods until a few Jews came to town and convinced them otherwise. Cheesed for being deceived (or more to the point, for deceiving themselves), “they stoned Paul and dragged him outside the city, thinking he was dead” (v. 19). People take their gods seriously. It’s a risky venture to mess with people’s minds regarding their beliefs. But if people are going to throw rocks at me, I’d rather it be because I told the truth and not because I exploited a lie.